During the first half of the nineteenth century, leaders of the United States could find no answer to the question of slavery. The dispute grew more threatening after the war with Mexico in eighteen forty-nine. Northern states refused to permit slavery in the new territories of California and New Mexico. Southern states declared that they had a constitutional right to bring slaves into the new lands. The South was ready to secede -- leave and break up the Union of states. Then, in eighteen fifty, Senator Henry Clay of Kentucky offered a compromise to avoid secession, and a likely war between the North and the South. He said the Union was permanent and created for all future Americans. He attacked the South's claim that it had the right to leave. 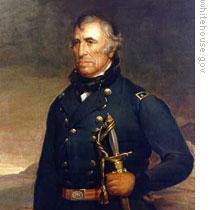 He warned that the war which would follow southern secession would be long and bloody. This week in our series, Jack Moyles and Lew Roland continue the story of the Compromise of Eighteen Fifty. Extremists on both sides opposed Clay's compromise proposals. So did President Taylor. The president had hoped that Webster, Clay, and other Whig Party leaders would support his own limited plan of statehood for California. The president's feelings were hurt when none of the party leaders thought that his idea was important. The president's chief adviser, Senator Seward of New York, was also against Clay's proposals. Seward strongly opposed slavery and did not believe it was right to compromise on it. One week after Clay spoke, Senator Jefferson Davis of Mississippi explained his position. He did not say much about Clay's proposed compromise. Davis was sure that no good would result from it, not even from stronger laws on the return of escaped slaves. He said these laws would not be enforced in states where people opposed slavery. Senator Davis said that what was needed was a change in the North's policy toward the South. He said the North must recognize the rights of southerners, especially the right to take slave property into territories of the United States. Davis said Congress had no right to destroy or limit this right. He admitted that the old Missouri compromise of eighteen twenty had limited the right to take slaves into the territories. He said the eighteen twenty compromise worked -- not because Congress passed it -- but because the states agreed to it. Senator Davis said the North was responsible for the growing split, because the North was trying to get complete control of the South. He said if these efforts were not stopped, the North some day would be powerful enough to change the Constitution and end slavery everywhere. Davis warned that the South would never accept this. Three weeks later, the Senate heard another southern leader, Senator John C. Calhoun. For years, Calhoun was the voice of the South. He now was sixty-eight years old and a sick man. He would die within a month. Calhoun had been too ill to hear Clay's speech. He spent the last week in February writing what he believed to be the true position of the South. 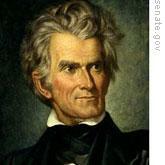 On Sunday, March third, it was announced that Calhoun would speak in the Senate the next day. Most understood that it would be his last speech. The Senate was crowded when Calhoun entered. One by one, friends came up to speak to him. The old man's long, gray hair fell to his shoulders. His face was thin and white. But his eyes were bright and his jaw firm. Calhoun was too weak to read his speech. He asked Senator Mason to read it for him. Calhoun said that for a long time he had believed that the dispute over slavery -- if not settled -- would end in disunion. Calhoun said it was clear now to everyone that the Union was breaking apart, that the ties that had held the North and South together were breaking, one by one. Three churches, once united across the nation, now were split between North and South. The two major political parties, he declared, were divided in the same way. Calhoun said the North was responsible for all this, because it had destroyed the political balance between the two parts of the country. As the population of the North had grown large, he noted, that part of the country had seized political and economic control. The North had passed tariff bills that the South opposed. It had filled most of the offices in the federal government. It closed the new territories to southern slaveholders. And, said Calhoun, it had viciously attacked the southern institution of slavery. The situation was so bad, Calhoun said, that the South could not -- with honor and safety -- remain in the Union. "How can the Union be saved?" he asked. "Not by the compromise proposed by the senator from Kentucky. There is but one way. A full and final settlement, with justice, of all the questions disputed by the two sections. "The South asks for justice, simple justice, and less she ought not to take. She has no compromise to offer but the Constitution, and no concession or surrender to make. She has already surrendered so much that she has little left to surrender." Then Calhoun listed the things the North must do to satisfy the South. He said it must give the South an equal right in the new territories of the West. It must make people obey the laws on the return of runaway slaves. It must agree to an amendment to the constitution that would return political balance to North and South. And it must stop the attacks against slavery. If all these things were not done, Calhoun said, then it would be better to separate, to part in peace. But if the North refused a peaceful separation, then the South would be faced with the choice of surrender or fight. "The South will know what to do," said Calhoun. When Calhoun finished his speech to the Senate, southern lawmakers crowded around the old man, congratulating him. But many of them could not agree with his extreme demands and the violence of his words. His appeal was too late. Most southerners believed that Clay's proposals were a reasonable way to settle the difference and protect the union. Clay was worried that his compromise might be defeated by northern votes. Many in the North felt slavery was wrong. They opposed the compromise, because it might permit slavery in the New Mexico territory, and because it called for stronger laws on the return of slaves who had escaped to the North. Eight days before he first proposed the compromise, Clay visited Senator Daniel Webster of Massachusetts. A friend of Webster's described the meeting in these words: "Mister Clay came to Mister Webster's house and had a long talk with him about the best way to settle the difficulties growing out of slavery and the new territories. I heard part of their conversation." "Mister Clay left after about an hour. Mister Webster called me to his side and spoke to me of Mister Clay in words of great kindness. He said he agreed generally with Mister Clay, that he thought Mister Clay's purpose was great and highly patriotic." "He said Mister Clay seemed to be very weak and had a very bad cough, that he was sure Mister Clay wanted to do something for the good of his country during the little time he had left on Earth. Mister Webster said further that he thought Mister Clay's plan was one that should be satisfactory to the North and to the reasonable men of the South. He said he believed that he could support all of it and would work for its approval in the Senate." Webster planned to speak in support of Clay's proposal. But he would wait until the best time for declaring it. He decided to make it on March seventh, just three days after Calhoun's speech was read to the Senate. Webster was sixty-eight years old, as old as Calhoun. His voice was weaker now. But his words rang with the same strength as years earlier. Our story of the Compromise of Eighteen Fifty continues next week. Our program was written by Frank Beardsley. The narrators were Jack Moyles and Lew Roland. Transcripts, MP3s and podcasts of our series can be found, along with historical images, at www.unsv.com. Join us again next week for THE MAKING OF A NATION -- an American history series in VOA Special English.